Hewlett Packard (HP) is the granddaddy of the consumer inkjet printer business, manufacturing the first DeskJets in the mid-1980s. My first decent printer was an HP DeskWriter (specially configured for Macintosh™ computers), which I bought in the late 1980s, around the time HP did their first big price reduction (for the DeskWriter) from around $1200 down to $800. Yes, back in the day, inkjet printers (mostly monochrome then) were much more expensive than consumer-grade dot-matrix printers (which weren’t exactly cheap, either). The obvious advantage to an inkjet was the 300 dpi x 300 dpi quality, and the printing speed (8-10 pages per minute). I learned how to refill the cartridges with a hypodermic needle and a bottle of Pelikan fountain pen ink. Admittedly that got old, real fast. My DeskWriter replaced a glacially slow Seikosha dot matrix printer (remember them, tech old-timers?). After a few years, I replaced the DeskWriter with some nondescript inkjet printer whose name now escapes me, when Apple did away with their custom printer port, and besides, I wanted color. I had that printer for a few years until, as my collection of Macs grew, I needed something I could put on my network. 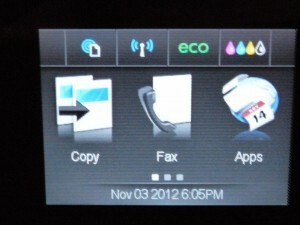 Enter the Lexmark Z65N (btw, Lexmark recently exited the consumer inkjet printer business). Boy, did they see me coming! My print demands, for the most part, were very small. Apparently just small enough that the print heads partially dried up between print jobs, and defied cleaning. That meant another $50 or 60 bucks for two new cartridges (black and a combined cyan, magenta, and yellow), which also dried up before I needed them again. Production jobs emptied those babies in no time at all (I discovered this when trying to print a bunch of MyMac business cards for one of the recent Macworld Expo events). Ultimately, I realized that probably 90% of my printing needs could be satisfied with a monochrome printer, and by the mid-late 1990s, laser printers got incredibly cheap (anyone remember the first Apple Laserwriter™ for a mere $5000?). I happily decided on a Brother HL-2070N (N stood for Network), that I still have today, and for which I only paid somewhere under $80. Cost per page to print on the laser was a fraction of a penny, compared with 5-10 cents per page on the inkjet. Color inkjet printing costs are probably still in that same 5-10 cent per page ballpark today, but goodness gracious, how they have improved in every other aspect! MyMac.com’s own John Nemerovski asked me to review a new all-in-one printer. All-in-one printers can print, scan, fax, and copy, all with really amazing quality, and at a price point that makes them affordable for most computer users. What I received in the mail was a Hewlett-Packard OfficeJet 6700 Premium e-All-in-One device. For all it did, it was really compact, though I still didn’t have room for it in my computer room (something to which both of my brothers will attest—I may not be a hoarder yet, but I’m working on it!). It went in the master bedroom, right next door, right above the aforementioned Brother Laser, which I connect to my network via a Netgear powerline adaptor. Even if I hadn’t had a wired network connection nearby, the HP OfficeJet 6700 Premium e-All-in-One device had Wi-Fi right out of the box, which permitted me (or you) to put it anywhere I (or you) had the space (about an 18 x 30 inch footprint), and not needing to worry about how to get it on your network. The unboxing was a piece of cake. All items were expertly positioned and cushioned thanks to great design by HP’s packaging engineers. It all slid out on my bed. The quick start guide at the very top of the pile assisted me in performing an inventory of all the bits and pieces before I embarked on the assembly and configuration process. Also at the top of the box was the CD, with drivers, PDFs of more extensive documentation, cables, and some apps for both Windows and Mac computers. There was even a 50+ page printed manual (! 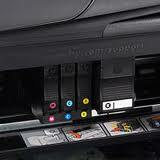 ), describing many of the specialty functions of the HP OfficeJet 6700 Premium e-All-in-One. Good show, HP! Score one for the technical writers! I began the assembly, undoing all the taped-down pieces, removing the foam wrap, locating the foil-packaged inkjet cartridges (“starter cartridges”—more about that later), power cord, power supply, and so on. I installed the cartridges (a very slick and expensive-feeling spring-loaded latch for each one—very nice), powered it up, and waited for it to go through its initial calibration, which went on for about 10 minutes. The test pages looked great, and I was on my way to finishing up the setup. I was disappointed to find that the supplied drivers only supported MacOS X 10.5 and newer. I’m in the process of transitioning from an older G5 Tower running Tiger (10.4), but I was able to load some older Gutenberg Project drivers to get some rudimentary printing from the old geezer (my computer, not me…well, maybe me, too), though few of the advanced features were available, such as duplex printing. Wireless setup was a bit of a pain, though much was my own doing. 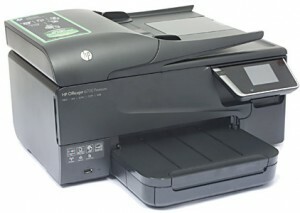 Wi-Fi configuration can be handled quite quickly, as the HP OfficeJet 6700 Premium e-All-in-One is WPS-compatible. This means that compatible devices can talk to WPS-equipped routers and exchange configuration data, so that you don’t have to do much of anything except push a few buttons when prompted to do so, automatically configuring IP addresses, passwords, etc. Problem is, WPS has been found to be a rather major network security threat, which can quickly allow bad guys to break into your supposedly secure WPA or WPA2 network, using the WPS mechanism. For that reason, I disabled WPS on my Cisco router. Of course, this meant that I had to manually enter the network settings, including a 20 or so character convoluted password from a tiny virtual keyboard on the device’s touch-sensitive front panel LCD. That was nearly as much fun as poking myself in the eye. I should have just enabled WPS long enough to do the configuration, as once it is set up, you don’t need to have WPS enabled to keep the connection alive. Nevertheless, once it was done, it worked fine (with the strains of Chet Baker singing and scatting “Do it the Hard Way” circling around in my brain…). A little bit about the front panel LCD. This is a really useful feature. It’s sharp, bright, and the type isn’t so tiny that it makes me say bad words. Some simple help functions and tutorials are built-in, and it guides you, step-by-step, through procedures like joining a network. Very well done. Bravo HP. This is the kind of stuff we were talking about doing at my previous employer’s 15 years ago, but were never able to. Now, with memory costs in the toilet, it’s really cheap to put in some useful in-device information that don’t require a user to drag out their manual or their installation CD to locate the PDF file of the main manual. And…we’re back. The “starter cartridges” were just that. Other than the ink expended during the initial calibration (HP requires the starter cartridges be used for that first use), I got about five pages printed before I began getting messages that I needed to replace one cartridge after another (no different than any other inkjet printer manufacturer). It was off to Costco® to buy the the “XL” versions of the cartridges (extra capacity…they say). About 90 bucks lighter, I replaced the cartridges and all was again right with the world. I’m sure I could have hit HP up for fresh cartridges, but with this review already being about three months late, I figured I’d better shut up and buy my own (+)(&)&^& cartridges. I tried out the scanner, and found it pretty neat that I could scan from across the room. I’m sure that if I had wanted to, I could have put photos on the scanner bed on a device in a different state, and then scan them to my local machine. Networks are fun. Quality-wise? Meh. The image was somewhat washed out, and required a little time in Photoshop to tweak the levels and saturation. I need to dig into the manual again to see if there are any calibration options. Fax? Admittedly, I had nowhere to fax to, but I’m pretty sure, based on HP’s outstanding reputation with their all-in-one products, that faxing is a quick setup and reliable, to boot. Copying? Well, put an original on the glass bed, push the copy button, and out comes a pretty decent color copy. Mission accomplished once again, HP. No complaints other than the standard one with good quality inkjet page printing, the time it took to print, and how wet the copy was. Setup to do wireless printing from my iPhone 4 was a little tricky, but once I downloaded and installed the free app(s) from the IOS store and dragged out the manuals (as a technical writer, I’m probably one of the worst when it comes to reading someone else’s work—physician, heal thyself!). After a few false starts, and realizing I needed to register with HP to enable this function, it was a real Godsend. I’ve been struggling with ways to get stuff printed from my iPhone for over a year. I think my only complaint was when I tried to print a photo from my photo album, it always blew the image up to fill the entire sheet of paper. That’s a lot of ink, my friends. I’m sure that if I looked harder, I could probably find the procedure to make the images a more reasonable (smaller) size. I will say that the print quality was quite good for what is basically a budget office all-in-one device. I was impressed with its edge-to-edge printing capability, and less impressed with the drying time. Admittedly, printing a full page photo on an inkjet printer means there’s going to be a lot of moisture thrown down onto the paper, so this is not unique to HP or any other inkjet printer manufacturer. I think one of the most amusing and entertaining behaviors of this printer, and a cautionary note for those who want to make sure document print quality is the best possible, is that the print head flying across the page generates a lot of mechanical force. My el-cheapo Staples® desk, while solid, rocked an inch or two side to side in sympathy with the print head. Probably not a biggie, quality wise, but it probably isn’t good for the printer that it is moving around so much. Again, not HP’s fault. Blame it on Staples! Blame it on the Bossa Nova (with apologies to Eydie Gormé—look it up)! About the only thing it doesn’t do is print directly onto CDs/DVDs like some of the Epson models do. My arsenal of tech junk includes a LightScribe®-compatible DVD burner, so not having CD printing capabilities isn’t a tragic loss. It’s not like I am lacking media marking options. So, for your $169.00, you can glom onto a really nice printer/scanner/fax/copier device that should meet all the needs of the average user, and maybe 85-90% of a power user’s needs. It’s well-built, reasonably quiet, and it carries the Hewlett Packard brand. Through all of HP’s recent strife, it’s still a respected brand for a darned good reason. Their stuff just works.